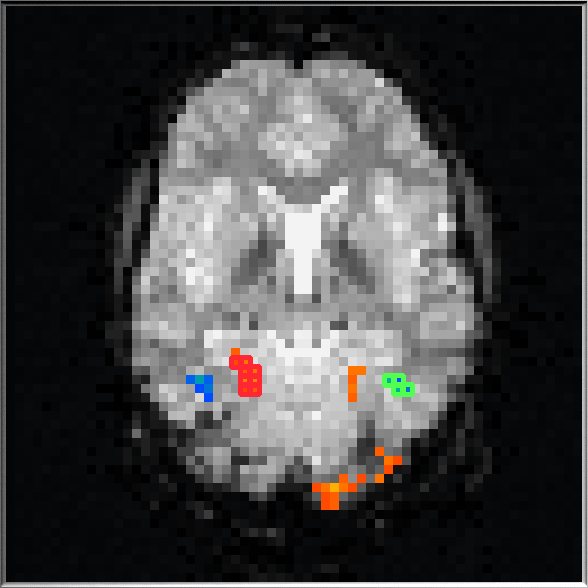 This view shows a single slice from the multi-slice arrangement in the whole space of the Brain View. The enlarged view allows to examine and modify regions-of-interest at the voxel level, which may be important for advanced applications such as neurofeedback. There is no icon or keyboard short cut to select this view. In order to switch to Single-Slice View you must select a slice in the Multi-Slice View by clicking at any position inside a target slice while holding down the SHIFT key. You may switch back to Multi-Slice Viewby SHIFT-clicking anywhere within the zoomed slice. Once in Single-Slice View, you may browse through the available slices one by one by using the PgUp and PgDn keys or Cursor-Left and Cursor-Right keys. The snapshot above shows an example of the Single-Slice View together with a snapshot on the right of the same slice in Multi-Slice View. The whole space of the Brain Window is used to display the selected slice. Note that the voxels belonging to a ROI are now highlighted as small colored rectangles filled with statistical or anatomical information. This visualization allows at the same time inspection of which voxels belong to a ROI as well as inspection of the information "inside" marked voxels. The most important feature of Single-Slice View is that an ROI can be altered at the voxel level by clicking on a pixel while holding down the CTRL key. If the CTRL-clicked pixel was not yet included in an ROI, it is added to the list of voxels of the current ROI. If the voxel belongs already to the current ROI, it is removed from the list of voxels. Note that you can specify the current ROI by clicking in the associated Time Course Window. The snapshot above shows parts of the program window (size 2, 1280 x 1024) with the same slice as shown above together with the time courses and beta bar plots of two ROIs on the right. The two ROIs shown in the first snapshot have been edited to become bilateral ROIs using CTRL-clicking of the respective voxels. Note that if a voxel is clicked without holding down the CTRL key, the list of voxels of the current ROI will be replaced by a list containing only the single selected voxel. Clicking in this way on different voxels allows to quickly inspect individual voxel time courses. Note that you can also define new ROIs by clicking a voxel while holding down the ALT key. Although the Single-Slice View is particularly well suited to define and inspect ROIs at the voxel level, you may also use the same rectangle dragging approach to define ROIs as described for the Multi-Slice View.